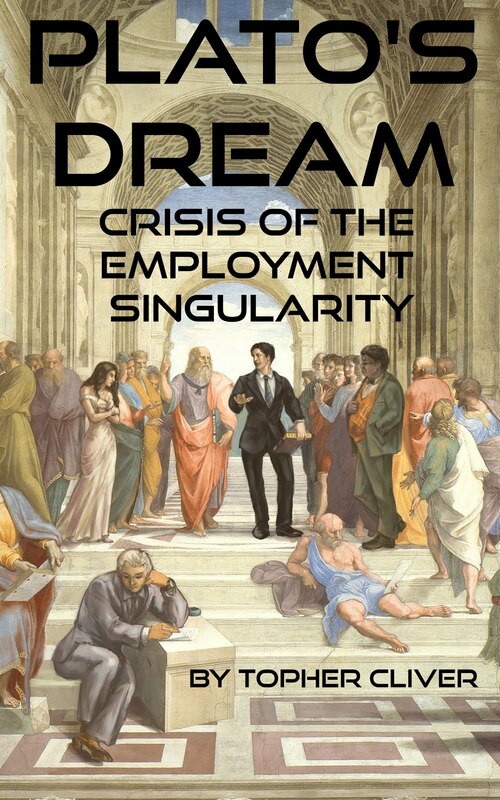 What is Plato's Dream: Crisis of the Employment Singularity About? Plato's Dream is a novel set in the near future, where technological unemployment transforms our society and threatens to destroy our economy and our way of life. What can be done and what will we have to sacrifice to survive? "This book was an excellent read." Do you know what’s over the horizon? The future is tomorrow. A crisis is coming and we have no plan. We have no leader. Technology is swift and thorough, leaving chaos in its wake. Robots are taking our jobs. They are making our products, crunching our numbers, driving our trucks, flipping our burgers. A time of revolution is coming. A technological revolution, an economic revolution, a robotic revolution, an employment revolution. A bloody revolution if we aren’t careful. The time of the employment singularity is beginning and what we do next determines if we thrive or die. People without work are dried out kindling stacking up on the floor of the forest of capitalism. Technological breakthroughs strike like lightning and the mighty winds of change are swirling through the world. We are but campers hoping for rain. Who will lead us to make the right decisions. Can we hope for the right outcome? One man will rise up to try and save the world but humanity’s greed and corruption stand between Armageddon and utopia. The future is bleak and the odds are long but Philip Kingsley is determined, charismatic, intelligent, charming, rich, flawed, and with all the right connections. Is he mankind's last hope or is he a pawn being used to slap chains on the unsuspecting masses? Is he a savior or a tyrant? Will capitalism be replaced? Are there other economic models for when our system breaks? What will we do for work? For income? Would it even be feasible to create a resource based economy or a universal basic income when people don’t want to fund food stamps for hungry children? Are we capable of evolution before revolution? Could the right leader bring us to the technological promised land just beyond the chaos of tomorrow? Plato said, "Until philosophers are kings, or the kings and princes of this world have the spirit and power of philosophy, and political greatness and wisdom meet in one, and those commoner natures who pursue either to the exclusion of the other are compelled to stand aside, cities will never have rest from their evils." What will we do in the coming crisis of the employment singularity? Will humankind find rest from the coming evils? Download Plato’s Dream now and find out today. -"This book was an excellent read." -"This book kept my eyes locked to the pages"
-"I would recommend this book to anyone interested in seeking the unexpected"
All Rights Reserved, Copyright 2015-2019 Georgia Business Internet Solutions, Inc |. Simple theme. Powered by Blogger.